Matthew Boulton and James Watt together had a great effect on the British coinage. Matthew Boulton was one of the greatest industrialists of his time. James Watt is familiar to every student as the inventor of the steam engine. In about 1772, Matthew Boulton turned his attention to the problems of the coinage, particularly that copper coins were being counterfeited. He applied his engineering success to ways of producing coins efficiently using steam power. By producing them efficiently, and incorporating design features difficult to copy, they could posses a high intrinsic value, which would deter counterfeiting by making it unprofitable. He proposed using a retaining collar to ensure a constant diameter, and using incuse lettering on a broad rim, which would protect the design from wear, and also be deter counterfeiting because of the heavy equipment need to strike the coins. He received no response from the Royal Mint, but proceeded to build several coining presses. In 1786, he won a 100 ton order for copper coins from the East India Company. In 1787, a government committee was formed to consider the state of the coinage, and Boulton was invited to attend in January 1788. As a result he was asked to produce patterns for halfpennies, which he offered to produce at about half the cost of the previous Royal Mint issue. Several designs appear to have met with approval, but none were coined for circulation, probably because of intransigence by the Royal Mint, who were reluctant to admit their incompetence, and the inadequacy of their machinery. Despite this, Boulton was confident in the superiority of his equipment, and continued to build more coining presses at his Soho Works in Birmingham. Eventually in 1797, Boulton was given a contract to supply 20 tons of twopences and 480 tons of pennies. These were the famous "cartwheel twopences" and "cartwheel pennies" of 1797. These magnificent and impressive coins weighed two ounces and one ounce respectively! A further order for the same quantities was received the next year. Unfortunately for collectors, these were issued with the same, 1797, date as the first issue. 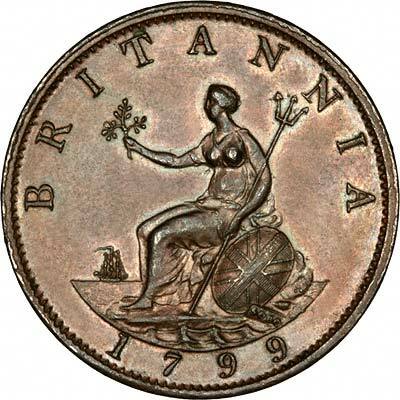 This was the first time Britannia had appeared on pennies or twopences. These were also the first copper penny and twopence to be issued. Britannia had now appeared on four British coin denominations. Popular demand from the public resulted in further orders, for halfpennies and farthings in 1799. For more information about pennies, please see our "Penny Story" page. Betweem 1805 and 1812, the Royal Mint was rebuilt, and all the new coining presses were supplied by Matthew Boulton. Many of these were so advanced and successful that they remained in use until as late as 1882. During the rebuilding period the Soho Mint received further orders for pennies and halfpennies which were dated 1806 and 1807. The words of the well-known song are usually misquoted as "Britannia Rules the Waves", but the correct version is a call for Britannia to rule the waves, not a statement that she already does rule them. With the new Soho Mint coinage, Britannia received a more nautical look. Her spear was changed to a trident, previously an attribute of Neptune the sea god, waves were shown washing around the rock upon which she is shown seated, and a ship was added on the horizon, symbolising Britain's naval power. The ship is believed to represent a warship, and the port-holes visible are actually gun-ports. 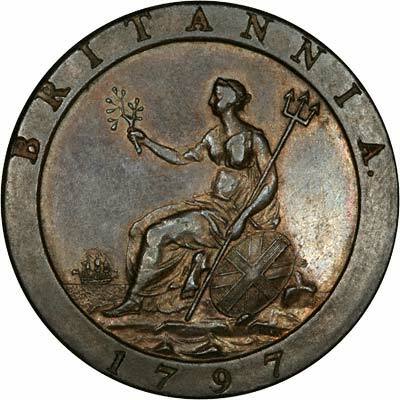 The freshly sculpted figure of Britannia on the Soho coins was engraved by Conrad Heinrich Küchler, a talented German designer who Boulton recruited in 1793.